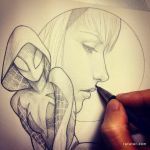 Spider-Gwen finished!!! Hope you like it!! THE * 5 * STAR * AWARD * OF * ÅWESOMENESS!! !™ From your Friends at: Hero World! On Pinterest!. (SUPER ÅWESOMENESS™) From your friends @: Hero World! On Pinterest. Awesome! I really like this! This is so dope! I would buy this as a poster! A wonderful illustration! The figure and the profile are superbly connected! Finally, the clever, limited, use of color, finishes out a fine work of art. I'm glad that I discovered your DA site, my friend! wow, lovely colours and texture! And yeah, Gwen's spider outfit is marvelous - I probably should draw one myself, since everyone is doing that. I actually am sorry that she's not the main spider-person now! Spooder Gawn must become a thing! I haven't been reading the comics lately so is she a fc? Oh man that's so much cooler than I thought you could make it. The pose in full with her bunched up on the ledge is really chilled and almost sassy. This is really good. Looks like you colored it with color pencils! thanks Rewrite98 ! Have you watched the video? Can't do it on my phone. very nice. love it. btw, i haven't read the comic yet, but do they explain the reason for the hood? Your work is great. But I'll never understand why Marvel designed her shoes like they did. Looks like she's running around in house slippers. Wow looking really good in color, well done! Love the more subdued colors, gives that sense of depth and realism. Excellent! Your welcome and keep up the great work!